I was in the car with TWD when I got the call. It wasn’t a call actually—it was an email—but “call” sounds way more dramatic, don’t you think? An agent, for those of you who don’t spend your every waking moment writing, thinking about writing or wishing you were writing, is the first step in the very long road towards publication. An agent is how your manuscript (or book proposal, in my case) makes the journey from its sad and lonely existence on the hard drive of your computer into the hands of an editor who might actually want to publish it. An agent is how you become a best-selling author with the eventual capacity to buy frivolous shoes (maroon high-heeled boots; I already have them picked out), a yellow Mini Cooper and, of course, a room of one’s own in which to write. Granted, I might be getting ahead of myself on that last one but like I said: it’s a first step. An important first step. And it works out well for you too because it means I cannot stop blogging, much as I would like to. Because publishers are all about “platform” these days and platform is all about social capital. Being the delightful man that he is, TWD kissed me and hugged me and told me how proud he was of me. 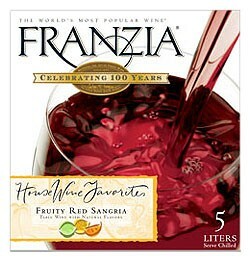 He then drove me to the liquor store where he bought me an entire box of sangria to celebrate. So we got the box-o-sangria, a bag of Smartfood Popcorn and—because it’s not every day that one receives an offer of representation from a bone fide literary agent—an entire bar of Lindt caramel and sea salt dark chocolate. After a trip to Barnes and Nobles (during which I started crying again), we drove back to his place, tried to make dinner, got a bit distracted and finally ended up enjoying our homemade peanut satay chicken a little later while watching back-to-back episodes of Millionaire Matchmaker. Congratulations Kat! Looking forward to hearing more about your literary pursuits! Glad TWD was there to celebrate with you. Keeping every part possible “crossed” in anticipation of eventual publication of your wonderful book. It will happen! And equally glad to hear about the blog getting worked on again. I know it is difficult to find subject matter, since you need to keep so much private these days, but I know you will find a way. Haha, I dunno… they make engraved box-o-wine covers. I might just have to invest in one to try to class it up a little bit! That is absolutely wonderful news! Congrats! 🙂 Please give me a little hint as to what your book is about. In exchange I will say nice things about you in Europe, which could well be a market you wish to break. Haha, thank you 🙂 But you should that sangria in a box is actually pretty damn good, LOL! This is great news, and it bodes well for getting published, because if one industry professional wants to invest resources in you, others will too. Felicitations! Thank you, thank you– that’s what I’m hoping! Congratulations! I am curious what the celebration for a book deal will look like.